A simple, made-from-scratch recipe for your standard buttermilk pancakes. Unfortunately, I've had boxed mix that tastes better than these. I knew something wasn't quite right when I saw how thick the batter was. I mean, pancake batter should be thick, but not as thick as this was. 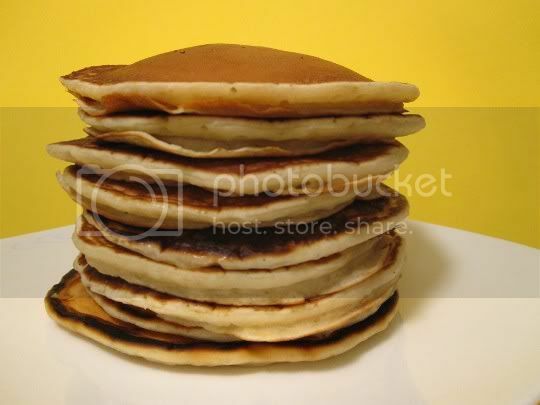 Personally, I like my pancakes a little on the thin side (better for multiple stacking), but I figured maybe these would be the hoecake-thick type. So not only did I have a problem with the batter, but the actual pancake was surprisingly tough and doughy, almost undercooked and too dense in the middle. And before you go accusing me of improperly cooking them, don't! First of all, it's a standard cooking rule that the first pancake never turns out right, but these browned and cooked evenly (on the outsides at least) and looked and smelled just like your standard version. But second, check the recipe link: even other reviewers complained about the density, texture, and taste. I didn't think you could go wrong with something as simple as pancakes, but I guess not every recipe can be a winner. Make again? No...a box of Aunt Jemima "just add water" mix will suffice.